A deep lot is often matched up with a narrow lot, but it extends deep affording the opportunity to build house plans from our small and narrow lot collection, but this isn’t necessarily always the case. 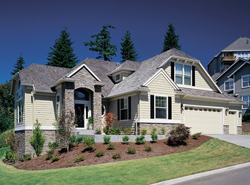 A deep lot can be wide as well, so our luxury house plans may be the perfect fit as well. This lot type provides an opportunity for a substantial front yard or plenty of backyard outdoor living space and children’s play area. A rear entry garage may also work well with this lot style. Browse our deep lot house plans to get great home ideas for this size lot. The Topfield Country Ranch Home has 4 bedrooms and 3 full baths. 2062 Sq. Ft., Width 32'-0", Depth 70'-0"
The Parsons Cove Traditional Home has 0 bedroom, 3 full baths and 1 half bath. 3148 Sq. Ft., Width 53'-0", Depth 104'-2"
The Pattyanna Country Home has 0 bedroom, 2 full baths and 1 half bath. 2533 Sq. Ft., Width 31'-4", Depth 72'-8"
The Taregan Craftsman Home has 3 bedrooms, 2 full baths and 1 half bath. 2962 Sq. Ft., Width 68'-0", Depth 90'-0"
2571 Sq. Ft., Width 25'-5", Depth 66'-4"
The Scenic Retreat Vacation Home has 2 bedrooms and 2 full baths. 1098 Sq. Ft., Width 28'-6", Depth 56'-0"
The Bogart Shingle Style Ranch Home has 3 bedrooms and 3 full baths. 1800 Sq. Ft., Width 63'-0", Depth 73'-0"
House Plans and More has a wonderful collection of deep lot house plans. We have easy-to-read blueprints helping a buyer visualize the look of their dream home when built. With a wide variety of home plans for a deep lot, we are sure that you will find the perfect floor plan to fit your needs and lifestyle.